A Trumpf TruPrint 3000 has been installed in Sintavia’s manufacturing facility in Florida, USA. 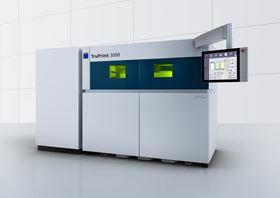 AM specialist Sintavia and the Trumpf Group, which focuses on machine tooling and lasers, plan to promote the use of Trumpf TruPrint metal printers in the aerospace industry. Following the agreement, a Trumpf TruPrint 3000 with industrial part and powder management has been installed in Sintavia’s manufacturing facility in Florida, USA. ‘[…]the TruPrint 3000’s build chamber is completely modular and secure — a requirement for Sintavia’s new Lean production facility,’ said Brian R Neff, Sintavia CEO. ‘Between Trumpf’s leadership in precision tool manufacturing and high technology laser applications, and Sintavia’s vertically aligned manufacturing platform, we feel that this development is a win-win for both parties,’ added Ralf Kimmel, Trumpf general manager.